All Windows 7 Users,If you are having Trouble in Windows 7 and Getting a Error Message like File is Missing or Corrupted then you should Repair You Window. There are Many Softwares Available to Repair Windows. But Instead of Using these Softwares, I am Going to tell a new Windows Trick to Repair your Windows without using any third-Party Software.We will Repair Windows using Command Prompt. You can do it very quickly because its very simple. This Article will Explain you How to do that. 1. 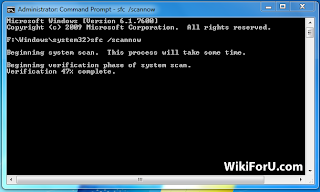 Run Command Prompt with Admin Rights by Run "cmd" or By Going All Programs-Accessories-Command Prompt. Protected System Files and Then Repair them if found any Errors. Feel Free to comment If you have Problems and other issues.We are Here to Help You.